Man vs. Nature is an ongoing struggle equally relevant to all inhabitants of our planet. In architecture, there exists a dilemma regarding building where we “want” to build and where we “should”. Pushing forward into nature, whether seeking a water bound coastal sunrise or majestic snow capped mountain view, is our way of reaching out and becoming part of the surrounding beauty. Successful design will always embrace the natural features of a site. Capturing daylighting and views, with purposeful building orientation to utilize any natural heating and cooling features of the terrain is a must. “Where” a building is located is the absolute very first design consideration made. Responsible placement includes various considerations, many pre-determined by local planning development and zoning departments. These entities work to contain town and city growth within decided acceptable parameters. Pervious and impervious paving and landscaping surface ratios, property setbacks and height restrictions, are all recommended to enhance our built environment within a region. In coastal cities, there are location specific guidelines focused on the point where buildings interface with the water. These guidelines are ever fluid, changing and evolving by necessity as the coast changes, with erosion and time. 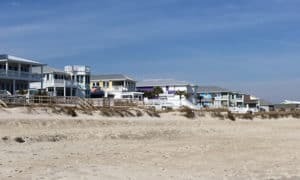 As careful as we are to guard this point of contact between man and nature, there are continuing repercussions of pushing the limits of our built environment, even when the pre-determined zoning criteria are followed and met. One consequence of our desire to build where nature and man will most certainly battle, is its effect on sea life dependent on the beach for basic animal reproduction. Unfortunately, nesting Sea Turtles fall directly into the path of our desire to enjoy the beach fronts where we build. 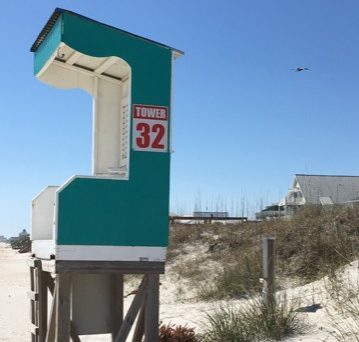 Thankfully, our coastal region has stepped up to solve and control this man vs. nature moment with local organizations such as the Pleasure Island Sea Turtle Project. 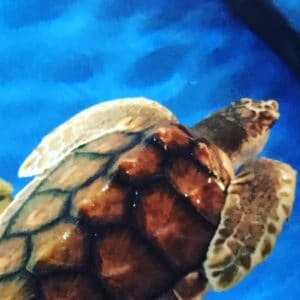 The Sea Turtle Project reaches out to the community to provide information that beach-goers can easily follow to help save the sea turtle eggs and hatchlings. 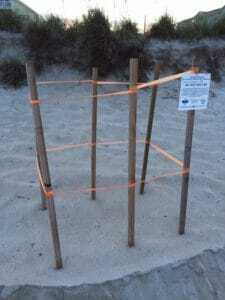 Volunteers protect the sea turtle nests along the island beaches by providing built physical barriers and constant monitoring, as seen in above photo of a current Sea Turtle nest on Carolina Beach. They assist with the hatchling turtles journey from nest to sea with guiding trenches and protection from overhead predators. 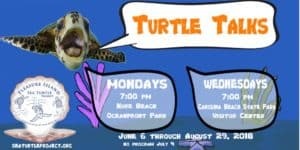 What better way to bridge the gap between man and nature … for more information visit http://seaturtleproject.org.